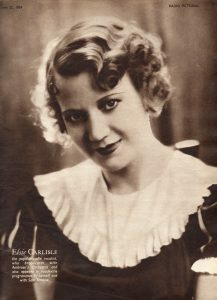 I am continuing to update the Elsie Carlisle YouTube Playlist and have recently put it in chronological order. Please inform me if you know of a clearer version of any song, of any film clips featuring Elsie (they are rare), or of anything else that I have omitted. We are up to 186 items, with no duplicates; we have only 156 to go! The list also includes the two Pathé short films featuring Elsie, as well as two scenes from Dennis Potter’s 1978 Pennies from Heaven television series in which characters mime Elsie’s songs. Absolutely love it . What a treasure! Is it possible that you are thinking of the song “My Handy Man?” It has the lyrics: “He shakes my ashes / And greases my griddle / Churns my butter / And strokes my fiddle.” It was recorded on a Filmophone record, which was floppy and intended not to break – the end result being that it flops around a good deal when one plays it! Let me know if that’s the one you’re thinking of.